(Host) As a snow storm approached, advocates for the homeless in the Northeast Kingdom began an overnight vigil on Bandstand Park in Lyndonville this afternoon (Friday). (Albright) Although Tropical Storm Irene didn’t wallop the Northeast Kingdom as severely as other parts of Vermont, it did force many families to take in relatives unable to stay in their own homes. Some of those temporary residents later ended up in shelters, or on the streets. But George Mathias, manager of Gilman Housing Trust, a non-profit organization in the Northeast Kingdom, says rural homelessness isn’t as obvious as it is on urban streets. (Mathias) "People are doubling up, they’re trying to find places to live with friends or family for short term, they’re couch surfing. They’re finding places to camp." 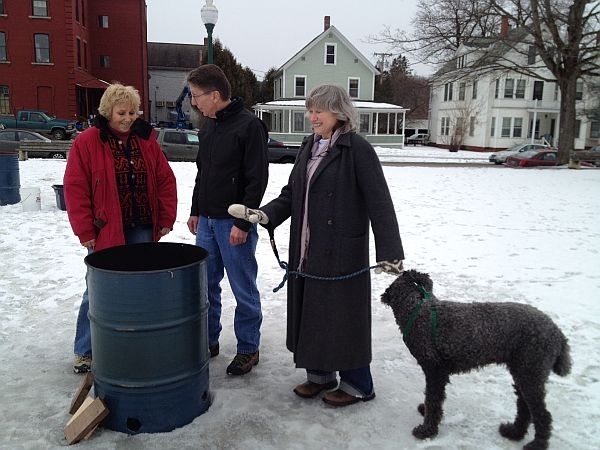 (Albright) Vicky Greenwood, who’s brought her dog and is warming her hands at a an oilcan fire at the vigil, has survived cancer, a brain injury, and a difficult divorce that left her homeless. She’s had to move into her parents’ small house. (Greenwood) "And my brother is already there and the household is stressed and I need to find some other housing. But it’s difficult, and with the storm Irene and so many other people needing help, I’m an invisible person." (Albright) Vigil organizers want to make her and others like her more visible through the evening, and hope that the snowstorm won’t deter other participants. They are accepting donations and trying to link homeless people with social services. The recent Occupy protests in Burlington brought to light problems of mental illness and substance abuse among some homeless people, but advocates say that doesn’t tell the whole story. This ongoing VPR series that looks at how the economy is affecting the lives of Vermonters returns for an update beginning August 3rd.